Cynthia Screen Scissor Type Stand Pull Up Portable Projection Screen 100"
Screen Material: Mildew resistant and easy to clean with soap and water. Fully black backed front projection screen material featuring a wide viewing angle. Dual wall and ceiling installation design, Lightweight steel case for easy installation. 14 Months Warranty and Lifetime Product Support by Cynthia Screen; a ISO9001 manufacturer. 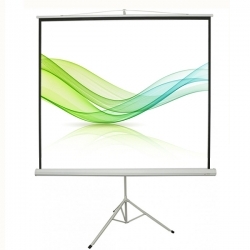 Motorized Projector Screens are operated by an electric motor that raises and lowers the screen via remote control or wall switch. Perfect choice for Home Theater, Conference Rooms, Classrooms, Office Equipment, Gaming, Gathering, Live Broadcast, Lectures, Exhibition etc. 1. The screen surface is mildew resistant and static resistant, easy to clean with mild soap and water. 2. Motor System: Energy efficient, quiet motor that enhances longevity. 3. Includes Radio Frequency (RF) remotes, which is perfect for wall or ceiling installation with simple plug and play system. 4. Control System: RF remote control distance 25m, Wall mountable control panel for use without remote. 5. Over 160 degree wide viewing angle, fully black backed front projection screen with 1.1 gain HD matte white textured surface. 6. With a black-backed screen for lower light penetration, 4-side black border masking, and a crisp, white matte screen, images on this screen will appear sharper, clearer, and more dynamic than ever. 7. Classic Octagonal Casing Shell, built-in tubular motor or synchronous motor, luxurious, running noise is very small, screen runs silently and smoothly. 8. Plug and play ready with the included remote control but can easily be controlled with the 3-way wall switch and allows for projector synchronization via the 12V trigger. Arris Shell: Square Shell, Octagonal Shell etc.